Taking on the damage control from trading SPX spreads. I tried hard to get into SPX trading but I wasn’t able to make any profit. I actually lost everything I ever made selling puts against dividend stocks. I am not saying that I will never trade SPX again. Never say never. I might go back one day, but currently I am so under-capitalized for trading this instrument, that I cannot trade it successfully anymore. You really need at least $50,000 dollars to trade spreads against SPX successfully. If you trade smaller account, you are undertaking bigger risk than necessary and most likely lose money. Why? Because of your emotions. I could see my emotions getting me into a huge pressure over possibly losing $100 dollars! Yes, just $100 dollars loss became a burden to me. Then I knew, that was my end of trading this instrument until I rebuild my account (again, yes I must admit I wiped out my account). Is it possible to recover an account and grow it from $1,500 or so back to $50,000 dollars? I believe it is possible. It will not happen overnight, but over the course of a few years yes, it is possible. As you can see, at first I was a bit successful trading whatever I could. Yet I lost money and had to start again. I found, learned, studied, and adopted put selling strategy. I increased my account from about $1,900 to $21,000 account in a year. I was so full of myself and I wanted more. I started trading (selling OTM) naked puts and naked calls at the same time (short strangles). I overdone it (traded more than I could afford in case I got assigned) and the tide started turning against me. Then I blamed the stocks (assignment risk, earnings risk, etc.) and continued trading SPX only. 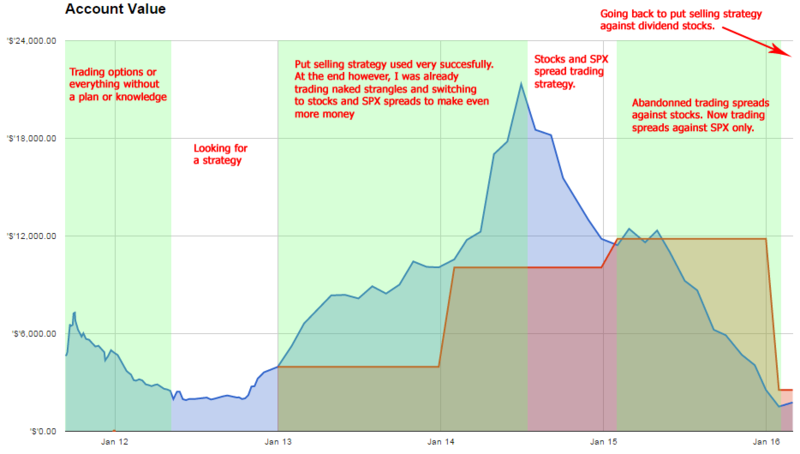 But my strategy for trading spreads against SPX was bad (actually non-existent). You can see how quickly I lost my money. The lesson is – stay with what works for you. This is why I am returning back to trading options against dividend paying stocks. You must trade this strategy only against stocks you are willing to own. 1) Sell puts against dividend stocks as long as you get assigned. 4) While waiting for assignment collect dividends. For the reasons above I am selling puts against Ensco (ESV) which pays dividends. It is a risky stock. The company is involved in offshore contract drilling services to the oil and gas industry worldwide. Thus it is tied to oil price and if the oil stays this low, who knows what can happen. Yet, I am willing to take this risk and I am willing to own this stock should I get assigned. In my previous post I wrote about selling puts against PSEC. The difference with ESV is that the volatility of this stock is a lot higher and I could afford to sell shorter term – April and collect nice premium 0.63 or $63 dollars. If by April the option becomes worthless, I will be able to sell another put option. If the stock gets to 0.05 before expiration I will buy it back to release money and sell a new option. If I get assigned (either early or at expiration) I will start selling calls (covered call strategy). I now will be trading both stocks – PSEC and ESV as long as I grow my account enough to switch into more expensive and somewhat better, less risky, dividend stocks such as ABT, CO, O, ADM, VLO, etc. As of now I need to stay with the cheap stocks and work it up. I did it once. I am positive I can do it again. · Don’t go anywhere! Subscribe! Yes, stay with me and follow my trades to see how they work and how you can make money following the same strategy. I created a Facebook group where I post my put selling strategy. Join me and see for yourself! I think you will be doing fine if you use margin and you will really improve your results, but I wouldn\’t use it as an excuse to change the strategy such as going closer to ATM rather than OTM. If you feel comfortable with going closer to ATM or be ATM then that\’s fine. I do it, because I am fine with it and I am fine with being assigned to the stock. But if you do not want assignment, then do not do it. The second thing with margin is to always watch your buying power and make sure you will never get into trouble if you get assigned. For example I first look at the trade what it would look like if I buy the stock, how much of the buying power will be consumed and based on that I open the trades, so I always make sure I will have enough money to get into the stock and not experience a margin call. Sometimes I forgot this rule in the past. So make sure you don\’t. Then margin will be your great servant and not master and you should do it. Look at it that way you will be using OPM (other peoples money) for quite cheap (depends on the broker but you can get margin anywhere between 1% – 9%. If you manage to make 12% on your options you will be profitable. Kudos for being so open and sharing your story. Lately, I started thinking on being more aggressive: using margin, going into bigger value underlying and going less out of the money. It sounds attractive at first sight, but I am not sure I can handle the bigger losses.